Ridiculous nonsense or cool and quirky must-have? 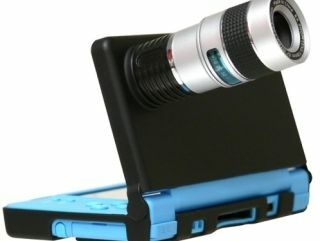 New zoom lens for Nintendo DSi - a quirky must-have or nonsensical rubbish? Peripheral maker Nyko is releasing a this HUGE add-on lens to bump up the DSi's 0.3 megapixel camera. The humungous 8x zoom lens is (thankfully) attached to a detachable Nyko Zoom Case. TechRadar supposes you could throw this hilarious device in your manbag for those odd occasions when you really need to take close-up and grainy pictures of flowers with your games console. Nyko's latest will only set you back a mere $25. It is sure to make you the envy of all your DSi-toting mates.